HomeCommunityAustralian Rugby Sevens Team and HKRU Celebrate at AISHK! 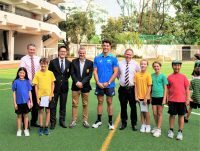 None other that the Australian Rugby Sevens team visited AISHK on Wednesday 3 April for a thrilling afternoon with students, staff and parents enjoying the special opportunity to meet their rugby heroes. A rigorous rotation of Sevens Mini-Challenges were stationed around the field with many students honing their rugby skills and resilience with the professionals themselves. AISHK was thrilled to welcome back to school our alumnus Simon Kennewell who was part of the visiting team. Simon enjoyed reminiscing with staff and students about his primary education at AISHK. Board members of HKRU, Mr Fred Au and Mr Tony Karton were also in attendance as we celebrated the HKRU’s generous sponsorship of our school field upgrade and refurbishment which took place over the 2018-2019 Christmas holidays. AISHK thanks the HKRU for their support in enhancing this integral aspect of our school facilities and community. AISHK is truly grateful to the Australian Sevens Team and their management for taking the time out of their intensive schedule to visit our school. 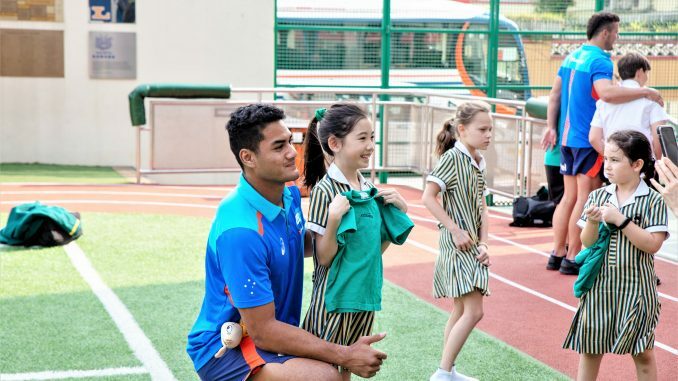 Ahead of the Hong Kong Sevens next week, AISHK says GOOD LUCK TEAM AUSTRALIA!